The University of Southampton has signed a five-year education agreement with the China Scholarship Council to boost academic research and institutional collaboration. The primary focus of China Scholarship Council (CSC) – University of Southampton PhD programme is for selected Chinese students to undertake PhD study at the University across a wide selection of disciplines including, business, electronics, engineering, health, humanities, medicine and natural, physical and social sciences. 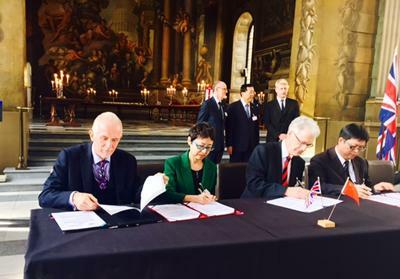 The signing of the programme was witnessed by Minister for Universities and Science Jo Johnson and China’s Vice Minister of Education Hao Ping at the recent UK-China Education Summit, part of the People to People event in London. The signing will further promote the University’s attendance at the International Graduate Scholarship Fair (IGSF) in China in October 2015. Up to 10 scholarships will be supported per year. The University will cover their full tuition and research fees and CSC will provide a living allowance (which includes health insurance), a return international airfare to the UK and visa application fees. The funding for each awardee will be up to four years. The University will provide a PhD supervisor for each successful candidate. Wherever possible, research collaboration between Southampton and the Chinese universities/research institutions from which the candidates come will be encouraged. This is seen as a channel for the development of long-term research collaboration between the University and Chinese universities/research institutions.